Hong Kong shopping and how to get there. Whatever you're looking for, fashion and beauty, Jewellery and watches, consumer electronics or Chinese traditions you'll have a variety of choice from street markets to luxury. Bargaining during your Hong Kong shopping is fun and a popular method of shopping in Hong Kong. However, most department stores and retailers do not practice bargaining, but they will often slash their prices during sales to attract customers. Bargaining at least 20 to 30 percent is an inherent part of Hong Kong shopping in the street markets. Being able to haggle for a good price is a good way to ensure you are getting a good price , and expected from the sellers. HONGKONG LAND - CENTRAL in Central, Hong Kong Island. A comprehensive commercial/retail space including; Alexandra House, Charter House, Prince's Building and The Landmark. 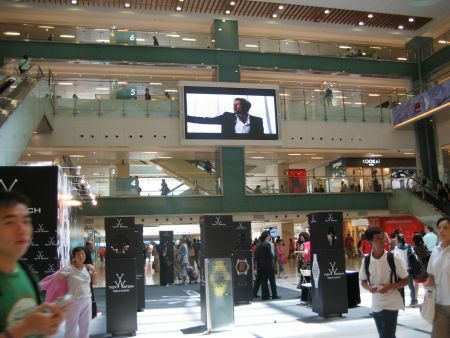 It offers shoppers an unrivalled Hong Kong shopping experience. Most of the buildings are interconnected by above street level, fully air conditioned passageways and house over 250 international high-end luxury retail brand names. Here's how to get there: The places mentioned above are located at Chater Road, Des Voeux Road Central, Pedder Street, and Queen's Road Central, Hong Kong. Board into the MTR trains and take the Tsuen Wan line towards Central. Get off at Central station and you can select either exit E, F, G or H.
IFC MALL - open 10:00 am - 10:00 pm daily With around 200 stores it offers international premier brands, flagship stores and unique concept stores. It is located near the Central waterfront and combines an extraordinary Hong Kong shopping experience with entertainment, sightseeing and dining. Here's how to get there. The IFC mall is located at 8 Finance Street, Central, Hong Kong. Take an MTR train (or the Airport Express trains that will get you to the Hong Kong MTR Station) and look for Exit A, E1 or F. You can also take the Star Ferry from Tsim Sha Tsui to Central which has the added attraction of a close look at the beautiful Victoria Harbour. MAN YEE ARCADE - open 7:30 am - 11:00 pm daily Located at the core of Central district, Man Yee Arcade has a wide variety of prime retailers and restaurants making it a perfect one-stop Hong Kong shopping spot for your unforgettable HK shopping experience. Here's how to get there: Man Yee Arcade is located at 68 Des Voeux Road Central and 67 Queen's Road Central. Take the MTR trains (or the Airport Express trains that will get you to the Hong Kong MTR station) Find Exit A or at the Central MTR station Exit C.
The Peak Galleria is a spacious complex that offers you not only great Hong Kong shopping and dining but also spectacular views over the city. So plan your day to include relaxing over a meal whilst enjoying the views of fabulous Victoria Harbour. The Peak Tower offers you four signature restaurants with stunning views and a number of innovative casual dining outlets. A very unique, festival and market style Hong Kong shopping arcade it features spectacular special lighting effects that helps to ensure that the New Peak Tower is one of Hong Kong¡¯s most compelling leisure destinations. Here's how to get to the Peak: Located at 118 - 128 Peak Road, The Peak, Hong Kong. HK has always been renowned for its spectacular Hong Kong shopping. Here's to view videos of Pacific Place Hong Kong shopping. Here's how to get there: Located at 88 Queensway, Hong Kong. Take the MTR trains that will get you to Admiralty MTR station and then take Exit F.
HONG KONG SEIBU This address delivers a stylish and delightful shopping in Hong Kong experience, with its fine selection of luxury fashion brands and wide range of distinctive merchandise including cosmetics, shoes, hand bags and accessories. Here's how to get there: Pacific Place Seibu - open 10:30 am - 8:00 pm (Sunday to Wednesday) and 10:30 am - 9pm (Thursday to Saturday) located at Pacific Place, 88 Queensway, Hong Kong. Kowloon Hotel Seibu - open 10:00 am - 10:00 pm daily. Located at 19-21 Nathan Road, Tsim Sha Tsui. Take the MTR trains that will get you to Tsim Sha Tsui station and then take Exit E.
This high-end Hong Kong shopping mall offers you international, luxury fashion brands and renowned restaurants. It is also linked to the neighboring Lee Gardens Two where famous fashion brands, exquisite eateries and a children's concept floor is also available for a complete one-stop Hong Kong shopping experience. Hong Kong has it all for all segments of shoppers travelling for shopping in Hong Kong. A word of advice – make sure to book your flights and Hong Kong hotels early if you plan on visiting Hong Kong during holiday season. It’s considered the peak period of the year, so flights and accommodations tend to sell out quickly if you don’t book ahead of time! Here's how to get there: Located at Hysan Avenue, Yun Ping Road, Percival Street, Leighton Road, Causeway Bay, Hong Kong. Take MTR trains "Island Line" that will get you to Causeway Bay and then take Exit F.
SOGO - open 10:00 am - 10:00 pm daily. A Causeway Bay Landmark, one of the largest department stores in Hong Kong offering hundreds of top international brands. SOGO also have a new branch in Tsim Sha Tsui, now the hottest department store in Kowloon side. Here's how to get there: SOGO Causeway Bay - is located at 555 Hennessy Road, Causeway Bay, Hong Kong. Take the MTR trains "Island Line" that will get you to Causeway Bay and then take Exit D.
SOGO Tsim Sha Tsui - is located at 12 Salisbury Road, Tsim Sha Tsui, Kowloon. Take the MTR trains "Tsuen Wan Line" that will get you to Tsim Sha Tsui and then take Exit F or G. Or, take the MTR Trains towards East Tsim Sha Tsui, get off at Tsim Sha Tsui station (last station), and take Exit J. TIMES SQUARE - open 10:00 am - 10:00 pm daily. 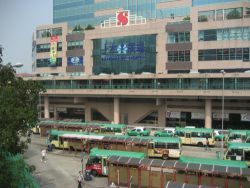 Comprised of more than 230 shops it is certainly one of the largest Hong Kong shopping malls in Causeway Bay. Offering you an exciting range of products as well as great restaurants. Here's how to get there: Located at 1 Matheson Street, Causeway Bay, Hong Kong. Take the MTR trains "Island Line" that will get you to Causeway Bay and then take Exit A. WORLD TRADE CENTER -WTC MORE - open 10:00 am - 11:00 pm daily. A favorite in the Hong Kong Shopping stable this Mall offers trendy shoppers stylish fashion. You can also enjoy the views of Victoria Harbour while relaxing and eating in the restaurants. Here's how to get there: Located at 280 Gloucester Road, Causeway Bay, Hong Kong. Take the MTR trains "Island Line" that will get you to Causeway Bay and then take Exit D1. Turn right and walk though Lockhart Road then turn left at the end of the street. CHINA HONG KONG CITY - open 10:00 am - 10:00 pm daily. This prominent Hong Kong shopping complex offers you exclusive panoramic views of Victoria Harbour as well as a great shopping and dining experience. Here's how to get there: Located at 33 Canton Road, Tsim Sha Tsui, Kowloon. Take the MTR trains "Tsuen Wan Line" that will get you to Tsim Sha Tsui, take Exit A, walk along Haiphong Road and then turn right into Canton Road. CHINESE ARTS AND CRAFTS (HK) LTD. - open 10:00 am - 9:30 pm daily. For the greatest collection of Jewelry, Arts, and Crafts this is the place to find the best of HK. Offers you jadeite, diamonds, rubies and handicraft products. Here's how to get there: Located at Star House, 3 Salisbury Road, Tsim Sha Tsui, Kowloon. Take the MTR trains "Tsuen Wan Line" that will get you to Tsim Sha Tsui station and then take Exit E. Or, take the Star Ferry from Central or Wan Chai to East Tsim Sha Tsui. DFS GALLERIA The world's leading destination for international travelers seeking the world's finest brands. All their products come with a 100% Worldwide Guarantee. Here's how to get there: DFS Galleria Sun Plaza - opens 10:00 am - 11:00 pm daily, located at The Sun Arcade, 28 Canon Road, Tsim Sha Tsui, Kowloon. Take the MTR trains "Tsuen Wan Line" that will get you to Tsim Sha Tsui and then take Exit C1, turn right and walk along Peking Road for about 3 minutes. DFS Galleria Chinachem - open 9:00 am - 10:00 pm daily. Located at Chinachem Golden Plaza, 77 Mody Road, Tsim Sha Tsui East, Kowloon. Take the MTR trains "Tsuen Wan Line" that will get you to Tsim Sha Tsui station and then take Exit G and an 8 minute walk along Mody Road. 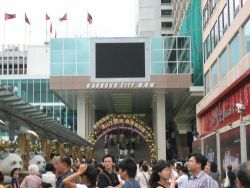 HARBOUR CITY - open 10:00 am - 9:00 pm daily. 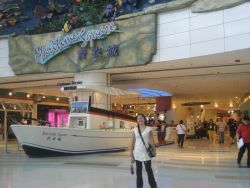 One of the largest Hong Kong shopping malls, it offers you a total shopping and dining experience. From luxury brands and delightful cuisine to entertainment and hotels. Here's how to get there: Located at 3-27 Canton Road, Tsim Sha Tsui, Kowloon. Take the MTR trains "Tsuen Wan Line" that will get you to Tsim Sha Tsui station and then take Exit A1 and walk along Haiphong Road for about 5 minutes. Or, take the Star Ferry from Central or Wan Chai to Tsim Sha Tsui. NEW WORLD CENTRE - open 10:00 am - 10:00 pm daily. 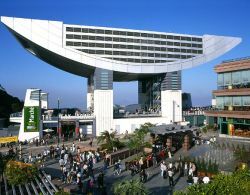 Hong Kong's shopping paradise, offering a huge variety of products and outlets along with more spectacular harbour views. Also introducing the new Avenue of Stars attraction situated nearby. Here's how to get there: Located at 20 Salisbury Road, Tsim Sha Tsui, Kowloon. Take the MTR trains "Tsuen Wan Line" that will get you to Tsim Sha Tsui station and then take Exit F. Or, take the MTR Trains towards East Tsim Sha Tsui (last station) and get off at Tsim Sha Tsui station and take Exit J. PARK LANE SHOPPER'S BOULEVARD - open 10:30 am - 11:00 pm daily. Featuring beautiful Kowloon Park nearby it is located on a prime spot along Tsim Sha Tsui's neon-lit Golden Mile. Another example of Hong Kong hopping paradise, offering you an open-style shopping mall with famous international and local brands. Here's how to get there: Located at 111-181 Nathan Road, Tsim Sha Tsui, Kowloon. Take the MTR trains "Tsuen Wan Line" that will get you to Tsim Sha Tsui station and then take Exit A and walk to your left for about 2 minutes. GRAND CENTURY PLACE - open 10:00 am - 10:00 pm daily. Offers you a new Hong Kong shopping and dining experience. A seven story mall comprises about 200 shopping outlets with a diverse mix of brand-name retailers and restaurants. Here's how to get there: Located at 193 Prince Edward Road West, Mong Kok, Kowloon. Take the MTR East Rail trains that will get you to Mong Kok East station and take Exit D.
Or, take the MTR trains that will get you to Mong Kok station and take Exit B3. Or, take the MTR trains that will get you to Prince Edward station and take Exit B2. LANGHAM PLACE - open 11:00 am - 11:00 pm daily. 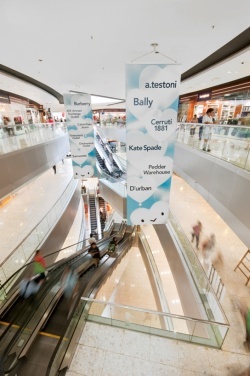 Comprising more than 250 shops, it offers you the comprehensive Hong Kong shopping, dining and entertainment experience. It features 83-meters Xpresscalators, The Digital Sky and Rock facade makes the place a new city landmark. Visit langhamplace.com.hk for more information. Here's how to get there: Located at the heart of Mong Kok, 8 Argyle Street, Mong Kok, Kowloon. Take the MTR trains that will get you to Mong Kok station and take Exit C3. apm - open 11:00 am - 2:00 am daily. Featuring late night international art and culture summer programs. Here's how to get there: Located at Millenium City 5, 418 Kwun Tong Road, Kowloon. Take the MTR Kwun Tong Line trains that will get you to Kwun Tong station and take Exit A2. MARITIME SQUARE - open 10:00 am - 10:00 pm daily. Offers you the hottest fashions and jewelry as well as popular electronics gadgets and a range of fine cuisine. Another one-stop Hong Kong shopping venue. Here's how to get there. Located at 33 Tsing King Road, Tsing Yi, New Territories. Take the MTR Tung Chung Line / Disneyland Resort Line trains that will get you to Tsing Yi Station then take Exit A. Or, take the Airport Express train to Tsing Yi Station. Or, if you are coming from Shenzhen, China and you pass thru Lo Wu immigration, please click here for alternate route to Tsing Yi. NEW TOWN PLAZA - open 10:00 am - 10:00 pm daily. Adjacent to the Sha Tin MTR station it is internationally renowned for fashion labels and a wide range of gourmet cuisines. Here's how to get there: Located at 18-19 Sha Tin Centre Street, Sha Tin, New Territories. 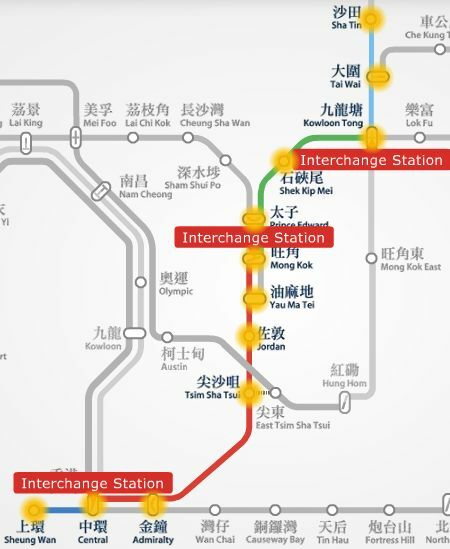 Take the MTR East Rail trains that will get you to Sha Tin station and take the Exit A. LANDMARK NORTH - open 10:00 am - 10:00 pm daily. With a footbridge link from the Shueng Shui MTR station, providing you a convenient Hong Kong shopping experience specially if you're coming from mainland China. Here's how to get there: Located at 39Lung Sum Avenue, Sheung Shui, New Territories. Take the MTR East Rail trains that will get you to Shueng Shui MTR station and take Exit B2. CITYGATE OUTLETS - open 10:00 am - 10:00 pm daily. Citygate outlets is the first, largest, and only outlet mall offering you more than 80 international brand names that offer year-round discounts of 30% to 70% off to make your Hong Kong shopping experience even more affordable. Citygate Outlets is also complemented by 16 food & beverage outlets and other entertainment facilities, such as the UA Citygate cinemas and a SPA by MTM. The Square is specially designed with an outdoor dining space located right next to one of the Asia's largest outdoor kinetic fountain for you to relax after a day of shopping. Citygate Outlets is the ideal starting point for your adventure on Lantau Island. The Ngong Ping 360 is just a few minutes walk away whileHong Kong Disneyland and Hong Kong International Airport are only 10 minutes away by local transport. Here's how to get there: Located at 20 Tat Tung Chung Road, Tung Chung, Lantau Island, New Territories. Tung Chung MTR station and near Novotel Citygate Hong Kong. Take MTR Tung Chung Line / Disneyland Resort Line trains that will get you all the way to the last station - Tung Chung, then take Exit C.
HONG KONG SKYMART - open 7:00 am - 11:00 pm daily. Dedicated to luxury Hong Kong shopping and sumptuous dining. Choices at the Skymart range from Duty-Free shops to top local and international brands and a worldwide gourmet selection in over 160 retail shops and 40 eateries. Here's how to get there: Located at Terminal 1, Hong Kong International Airport (HKIA), Lantau Island, New Territories. Take the Airport Express Trains to get you to Airport Station, and take the Left Exit. SKYPLAZA - open 11:00 am - 9:00 pm daily. The Newest Hong Kong shopping, dining and entertainment spot at HKIA. Over 100 shops, 25 catering outlets and HK's first 4-in-1 entertainment concept with 4D Extreme Screen Cinema. Here's how to get there: Located at Terminal 2, Hong Kong International Airport (HKIA), Lantau Island, New Territories. Take the Airport Express Trains to get you to Airport Station, and take the Right Exit. Aside from these popular shopping malls, Hong Kong is also well known to itsstreets markets for bargain shopping.